Oregon vines started in Spring about two weeks behind. At first this was great, as the weather was warm and dry and bloom and consequently fruit set was fantastic. Not a shot berry in sight. Lag phase and the clusters are full and long. a bountiful harvest predicted. Still all is well. Summer was dry, as it is in Oregon, and very hot, more so than usual and even a bit drier. The heat actually slowed down ripening. Powdery mildew and reports of it from other vineyards are rampant. Antonio and Jim were on it, like fruit flies in the tasting room! Now we get a bit anxious, as a normal expectation of maturity is behind and yet still within a normal range, given Oregon’s, normal (Average), not near term history (past five years). 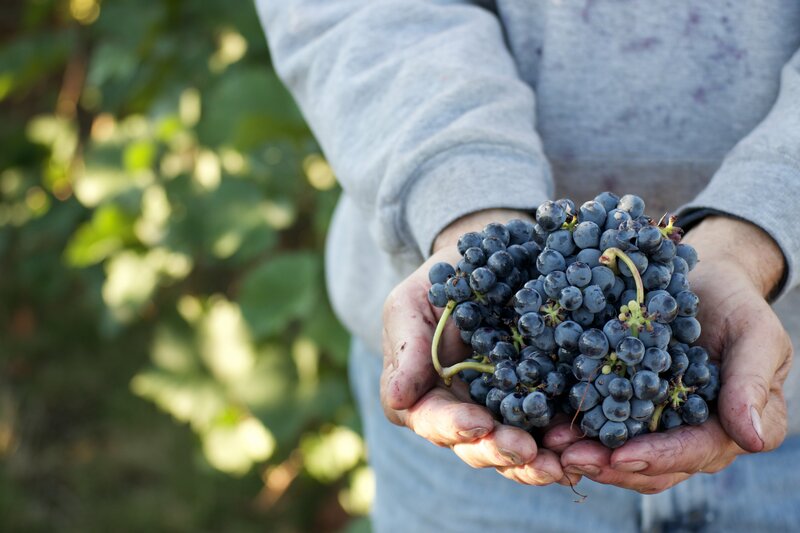 Harvest for Eola begins September 14, with the always ripe M Foch, a chance to fire up the harvester and tune it up for the Pinots to be picked soon. Weather in the form of clouds and precipitation have arrived earlier than expected. All is not lost, until suddenly, the forecast is 5 days of rain and nearly 7 inches predicted. PICK<PICK<PICK<PICK, and the winery is full, and there is still 250 tons hanging through the rain. Unripe! Long range forecast is 50-90% chance of precipitation every day for the next 30. Looks like harvest is over. We could really have used those two weeks we lost back at bud break, or had half as many 100 degree days. Miracle! forecast and reality changes and there is a ten day or more window of nearly 70 degree weather and we clear tanks, harvest resumes and pick the remaining fruit. Finishing strong with the Fossil Block 828 clone Pinot and Legacy Riesling on October 31, to close out the harvest phase for 2017. Totals are 1365 tons, 1085 for Eola proper, and 280 tons custom crush. Quality is good, and we will produce a great value wine at a great price. The typical blocks that always shine, continue to do so. Wolf Hill 667on RG, Burgundy Block, Fossil Block Pinot, Oak Grove fields 4 and 5. The 828 clone Pinot that is normally the least favorite of mine, had the advantage of hang time and has come to the winery in a great state and with flavor this year. I am working the magic to make it the best ever 828 clone Pinot, Eola has ever produced. Who knows, maybe I will select it for the barrel select this vintage? New this year, I am experimentally fermenting a white Pinot Noir. That is right! A white, or clear Pinot. Think Rose’ but without the blush of color!? Eola Hills Wine Cellars Inc.